Craig Simpson, president and CEO, Rocky Mountain Composites, wishes he'd discovered OpenCNC® software sooner. If he had, he could have saved almost $250,000 on a project that required 5-axis machining. 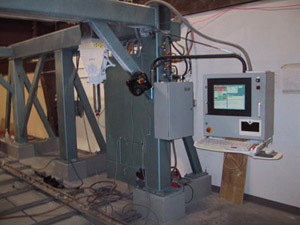 The company had built a 6-ft. x 10-ft. x 4-ft. overhead gantry mill in 1996, but the machine's proprietary control just never performed up to expectation. As a result of ongoing control problems, Simpson had to outsource a large portion of a major project, which could have been completed in-house. "I finally told them they needed to pull the plug on the old control and find a new one," said Steve Henrie, owner of Mech-Tek, Inc., Salem, Utah, an integrator and rebuilder who had been called in repeatedly to help prop up the old control at RMC. "They'd already tried installing new drives with the old control and that didn't work." "Where there hasn't been a tool, we've built one. Where there hasn't been an innovative solution, we've designed one," is the slogan of Rocky Mountain Composites (RMC) of Spanish Fork, Utah, a pioneer in the design, building, testing, and production of advanced composite structures. Composite materials, stronger and lighter weight than steel, are especially useful in the aircraft business, RMC's predominant customer base. The company looks to solve manufacturing problems through creativity and resourcefulness, and they expect the same from their vendors and integrators. Henrie of Mech-Tek, although now an MDSI integrator, hadn't heard of MDSI's OpenCNC® software CNC when he started his search. But with 20 years of experience in automation and controls, he knew what he needed to retrofit the RMC gantry milling machinea CNC control that would conform to his design. "Two of the axes were manual," Henrie said, "and we wanted to put encoders on them and have the CNC software interpolate location. All the control vendors said they could do it, but when it came right down to it, they couldn't. Only MDSI could." Part tolerances improved from 0.025 in. with the original control, to 0.005 in. with OpenCNC, over a 24-ft-long part. "They could get the tolerance even closer if they'd eliminate the last bit of backlash from the machine," Henrie says, "but they're so happy with the performance, they don't want take the time!" Cutting speeds increased from 75 ipm to 300 ipm. "Even when the original control was new, we weren't getting this kind of performance from the machine," Simpson said. "Before we were only able to run the machine a few times a month. Now we're using it more because it's so fast." Increased flexibility in manufacturing and in business strategy. "We like to pull the best components and build our own equipment," said Craig Simpson. "OpenCNC is very flexible, very user friendly. It was lower cost to install, you're not tied in, and you can set it up however you want. We're very pleased." Dollar for dollar, the MDSI control is just better, says Mech-Tek's Steve Henrie. "If you compare MDSI's control to the big boys in the industry," Henrie says, "MDSI is not only somewhat cheaper, it's a much better product. You get a much bigger bang for your buck!" Henrie is already working on his next OpenCNC installation at RMC, a 9-axis, floor-mounted winding machine 17 feet in diameter, with a 50-ft. stroke. The MDSI control will again be called upon to do something that a traditional CNC control could not docombine a composite winder and a router in one machine, using a single control running from a single PC. The huge machine, capable of winding entire fuselages for single-engine aircraft and small business jets, is equipped with two heads. Once retrofitted with OpenCNC, the machine will be able to run both heads as routers, or switch modes and run a winding process. In addition, because of MDSI's patented multiple job streams technology, which allows OpenCNC's core motion software to be configured to run any class of machine, with any number of axes and any number of job streams, operators will be able to run two separate routing programs at the same time, one from each headall from a single PC. "Nobody has ever done any of this before," Henrie said, "and you can't go buy a new machine to do this. The customer should only be limited by what he can devise. Before MDSI and OpenCNC, the control vendors set the limits."